Freshman guard Justin Mazzulla jumps to a stop in a men's basketball game against Hampton in November. Less than two months ago, men’s basketball scored 46 points in one half. But on Wednesday night at Davidson, the Colonials (8-9, 1-3 A-10) were only able to muster 45 points throughout the entire game. GW’s lowest scoring total of the season and a potent Wildcats offense combined to allow Davidson (8-7, 3-1 A-10) to come away with a 72–45 victory – the largest losing margin of the Colonials’ season thus far. The loss continues Davidson’s streak of dominance against GW at home. The Colonials have now lost the road side of the matchup for four consecutive years and have not won in Davidson since the 1966-67 season. 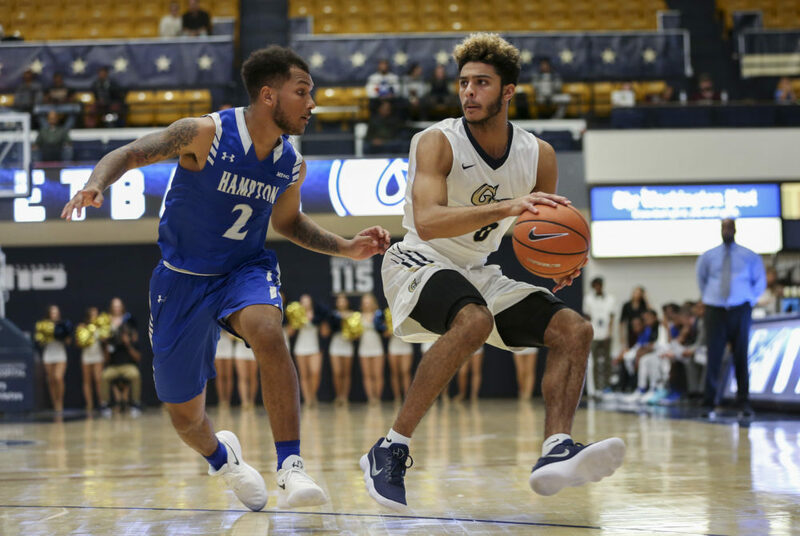 Over the past week, GW has dropped all three of its matchups, including a 21-point loss to Rhode Island Saturday – previously the team’s biggest loss. Joseph said he is ready to see how his team responds with another road game just three days away. Amid the losing skid, the Colonials attempted to shake things up to match the kind of sets that Davidson runs. Joseph made his first change to this season’s starting lineup in this game – putting graduate student forward Bo Zeigler in instead of sophomore forward Arnaldo Toro. Joseph said the change was made in hopes of keeping up with the Wildcats’ offensive pace. Later in the game, other changes allowed freshman guard Justin Mazzulla to see extra minutes as a third or fourth guard in a small lineup. Mazzulla played a career-high 22 minutes on the night. Four different Wildcats were able to garner double-digit point totals against the Colonials defense. Davidson freshman guard Kellan Grady scored a game-high 19 points on 7-of-13 shooting. He dominated the first half offensively – scoring 15 points in the opening 17 minutes. As the game progressed, senior forward Peyton Aldridge and sophomore guard Jon Axel Gudmundsson increased their efficiency and began to break down GW’s man-to-man at different spots. Aldridge finished with 15 points and a game-high four assists and Gudmundsson tallied 14 points and a game-high nine rebounds. Aldridge – who averages just more than 20 points per game – was tightly matched by senior guard Yuta Watanabe in the first half and double teamed when receiving the ball. Joseph said his squad showed a good effort against Aldridge in the first half, but sometimes lost him when trying to guard the perimeter later in the game. Davidson finished the game more than four total points under its season average, but shot an efficient 30-for-56 from the field and outscored the Colonials by double digits in both halves. The Wildcats’ imposing offensive performance did not overshadow their consistency of stopping GW from getting good shots or connecting any runs. Watanabe led the Colonials with 12 points and freshman guard Terry Nolan Jr. followed closely behind with 10 points, but that was the extent of their offensive success. GW shot 32.7 percent from the field and had challenges getting any good shots against Davidson’s zone defense. During the night’s first four minutes, the two sides traded baskets and remained close as three-pointers from sophomore guard Jair Bolden and Nolan matched Grady’s early offensive outpour for Davidson. The Wildcats were making shots – but against an aggressive GW defense, the points were earned through individual displays. Davidson did not earn an assist in the first 18 minutes of the first half – an unusual trend for the Atlantic 10’s top assist team. Aldridge’s first basket of the game and more points from Grady allowed the Wildcats to go on a 11-0 run and significantly alter the matchup’s momentum. After 16 minutes of play, the Colonials were trailing 23–10 – the largest score differential of the first half – and struggling to find the back of the net. Baskets from Watanabe and Nolan inched GW closer as the halftime break neared, but two baskets in the half’s final 90 seconds gave Davidson a 29–17 lead with 20 minutes to play. At four different times the Colonials pulled the game under 10 points in the second half – including a momentum three from Watanabe with about 13 minutes to play – but the Wildcats had a response at every occasion. Over the next seven minutes, Gudmundsson and Aldridge led Davidson on a 16-5 run that closed any remaining chances for GW to make a comeback. The Colonials only scored three more baskets during the remainder of the game as the Wildcats stretched their advantage to as many as 29 points. GW will return to action for its second consecutive road game Saturday against Richmond (3-13, 1-3 A-10).